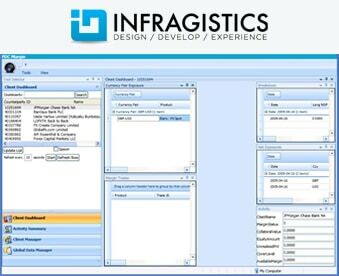 Our Infragistics web solutions empower developers to build and style great application user interfaces for Windows Forms, ASP.NET, WCF and WPF. We at ANGLER offer Infragistics Technology to build and style immersive user experiences and rich data visualization in line with business applications across all platforms – Windows Forms, WPF, ASP.NET and Silverlight. Our Infragistics Net Advantage provides the most comprehensive set of components for building and styling commercial class user interfaces quickly. ANGLER also provides interactive user interface in Windows and Web based projects using Infragistics. Implementing Spreadsheet functionalities in .NET application is a common requirement for various clients now-a-days. ANGLER has satisfied these client requirements through the UltraGrid control available Infragistics. UltraGrid control also provides various built-in and custom functions as like in Excel. Other controls which ANGLER has used extensively in .NET applications are UltraTab, UltraLabel, UltraButton, UltaChart, UltarComboEditor. ANGLER offers quality Offshore Development Center (ODC) services to clients and makes use of Infragistics advanced user interface controls to enable developers produce all familiar interfaces the users usually expect such as Office 2007 UI, Windows XP, and Vista. Infragistics controls are widely deployed for use in the hottest architectures such as Web 2.0, SharePoint and Microsoft’s Composite Applications Block (CAB). Easily and with great flexibility, Infragistics Applications & Solutions offer precise look and feel of today’s most popular interfaces to the likes of Microsoft Office, Windows and other Microsoft applications. ANGLER Technologies offers Infragistics Web Solutions to customers globally in India, USA, Singapore, Hong Kong, The Netherlands, UK, Dubai, Canada, and South Africa. ANGLER empowers developers to build and style immersive user experiences and rich data visualization in line of business applications using Infragistics. Infragistics contains varieties of charting controls. ANGLER has satisfied various clients using interactive charting designs. ANGLER products are having style their applications with the exact look and feel of Office 2007, using the NEW Infragistics Ribbon, Scheduling, Galleries, Styles, and more. ANGLER created so many AJAX-enabled websites using Infragistics Ajax-enabled, ‘Atlas’-ready ASP.NET controls are now also easily styled with the latest Office 2007 UI, including WebCalendar™, WebChart™, and WebGrid™. Contact us today to know more about our Infragistics web development services or to hire our Infragistics developers for your needs.